Pliny the Elder sailed into danger when Vesuvius erupted, and never returned, but a body found a century ago 'covered in jewelry like a cabaret ballerina' may really have been his. Given that Italian cultural and scientific institutions are mired in budget troubles, the Pliny project is seeking crowdfunding for the scientists, who also studied Oetzi the Iceman – the 5,300-year-old mummy found perfectly preserved in an alpine glacier. 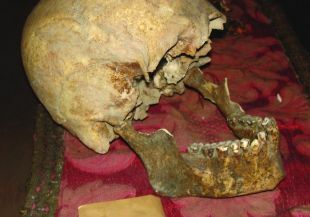 The remains now believed to be Pliny's were found more than a century ago. But identifying the body has only recently become feasible, says Andrea Cionci, an art historian and journalist who last week reported the findings in the Italian daily La Stampa. Gaius Plinius Secundus, better known as Pliny the Elder, was the admiral of the Roman imperial fleet moored at Misenum, north of Naples, on the day in 79 C.E. when Vesuvius erupted. According to his nephew, Pliny the Younger, an author and lawyer in his own right who was also at Misenum and witnessed the eruption, Pliny the Elder's scientific curiosity was piqued by the dark, menacing clouds billowing from the volcano. Initially he intended to take a small, fast ship to observe the phenomenon. But when he received a desperate message (possibly by signal or pigeon) from a family he knew in Stabiae, a town near Pompeii, he set out with his best ships to bring aid not only to his friends "but to the many people who lived on that beautiful coast." He would have had about a dozen quadriremes, warships with four banks of rowers, at his disposal, says Flavio Russo, who in 2014 wrote a book for the Italian Defense Ministry about Pliny's rescue mission and the tentative identification of his remains. These ships were some of the most powerful units in the Roman naval arsenal, capable of carrying some 200 soldiers (or survivors) on deck while braving the stormy seas and strong winds stirred up by the eruption, Russo told Haaretz in an interview. "Before him, no one had imagined that machines built for war could be used to save people," he said. The Roman fleet made the 30-kilometer journey across the Gulf of Naples at full speed, launching lifeboats to collect the hundreds of refugees who had made their way to the beaches. According to Pliny the Younger, his uncle also disembarked and went looking for his friends in Stabiae. But as he was leading a group of survivors to safety, he was overtaken by a cloud of poisonous gas, and died on the beach. 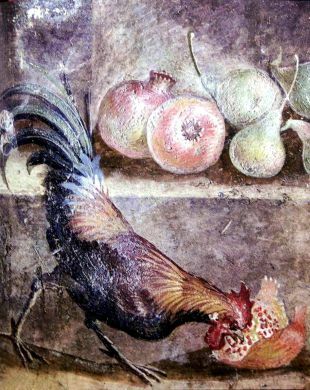 Bodies found in Pompeii's boat sheds after Vesuvius erupted 2,000 years ago. We do not know how many people reached the safety of the ships before the cloud moved in. 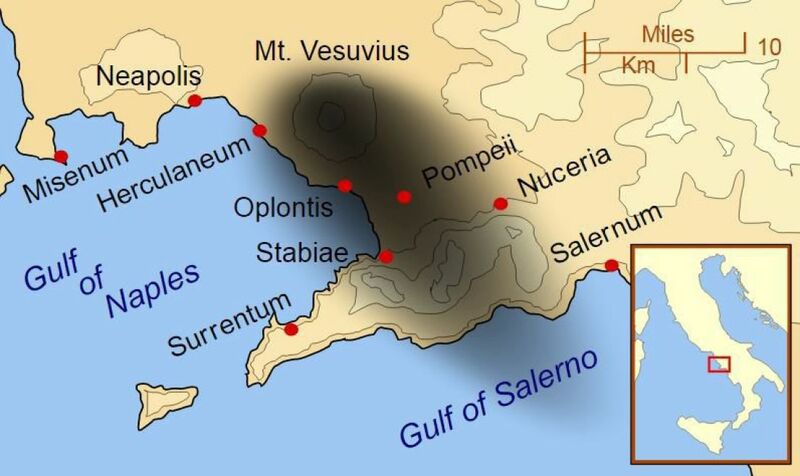 Russo estimates the fleet may have saved up to 2,000 people – a number roughly equal to the estimated number of those killed in the eruption, as the volcanic spew wiped out the towns of Pompeii, Herculaneum and Stabiae. Pliny the Younger's description of the eruption is considered so accurate that experts today call similarly explosive volcanic events as "Plinian eruptions." 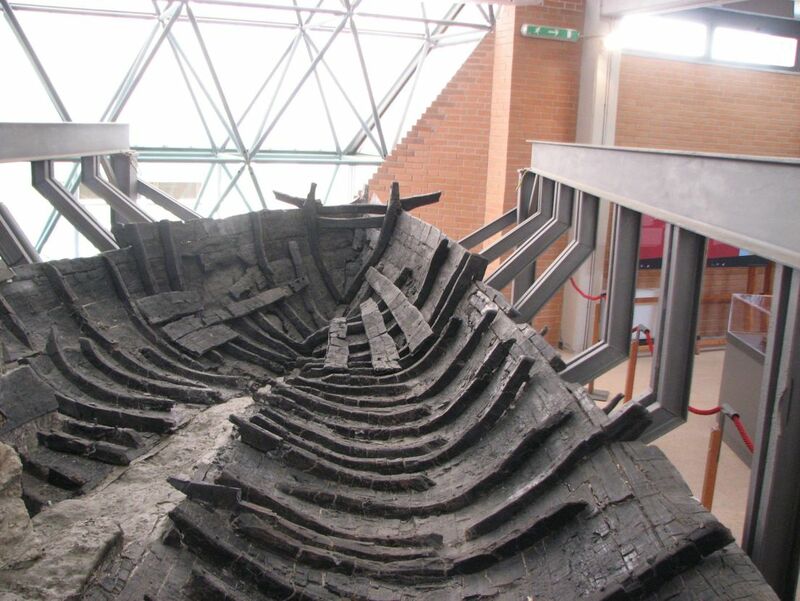 Indirect evidence confirming his story was found in the 1980s, when archaeologists digging at the ancient port of Herculaneum uncovered the remains of a legionnaire and a burnt boat, possibly one of the lifeboats and a crew member dispatched by Pliny's fleet. 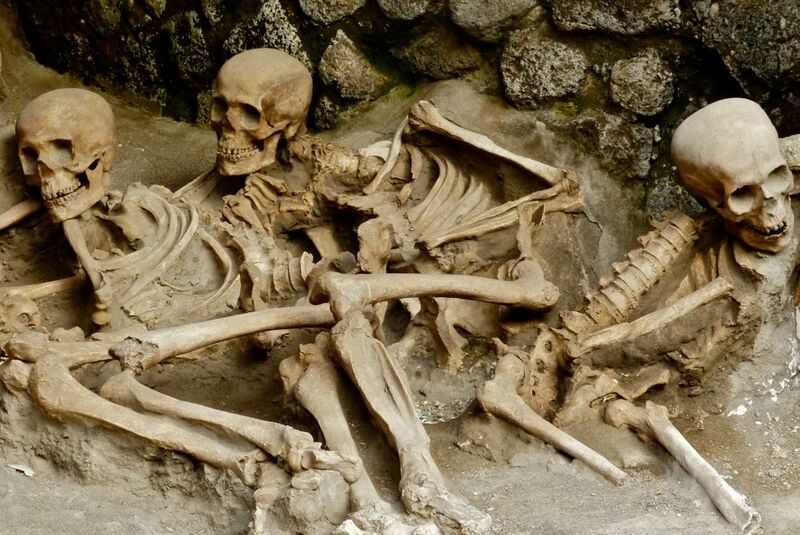 They also found the skeletons of some 300 people who had sought refuge in the covered boat sheds of the port, only to die instantly when the so-called pyroclastic surge, a superheated cloud of volcanic gas and rock typical of these kinds of eruptions, rolled down Vesuvius, killing everyone in its path. Matrone was quick to theorize that he had found Pliny's remains. Indeed, the he place and the circumstances were right, but archaeologists at the time laughed off the theory, believing that a Roman commander would not run around "covered in jewelry like a cabaret ballerina," Russo said. Humiliated, Matrone sold off the jewels to unknown buyers (laws on conservation of archaeological treasures were more lax then) and reburied most of the bones, keeping only the supposed skull of Pliny and his sword, Russo said. These artifacts were later donated to a small museum in Rome – the Museo di Storia dell'Arte Sanitaria (the Museum of the History of the Art of Medicine) – where they have been kept, mostly forgotten, until today. Russo, who has been the main driving force behind efforts to confirm the identification, says that judging by Matrone's drawings, the jewelry found on the mysterious skeleton as well as the ornate sword are compatible with decorations common among high-ranking Roman navy officers and members of the equestrian class, the second-tier nobility to which Pliny belonged. Furthermore, an anthropologist has concluded that the skull held in the museum belonged to a male in his fifties, Russo said. We know from Pliny the Younger that his uncle was 56 when he died. With evidence mounting, Russo and Cionci turned to the Oetzi the Iceman team to have them perform more tests on the skeleton from Stabiae. "We are not saying that this is Pliny, merely that there are many clues that suggest it, and we should test this theory scientifically," Cionci said. "This is something unique: it's not like we have the bones of Julius Caesar or Nero." Researchers plan to carry out two tests: a comparison between the skull's morphology with known busts and images of Pliny, and, more importantly, an examination of the isotope signatures in his teeth. "When we drink water or eat something, whether it's plants or animals, the minerals from the soil enter our body, and the soil has a different composition in every place," explains Isolina Marota, a molecular anthropologist from the University of Camerino, in central Italy. By matching the isotopes in the tooth enamel, which is formed in childhood, with those in soil samples, scientists can determine where a person grew up. In the case of the Iceman, they managed to pinpoint the Alpine valley where he had spent his childhood. For Pliny, they would look for signatures from the northern Italian town of Como, where he was born and bred, Marota told Haaretz. She estimated the tests would cost around 10,000 euros. Once the money is found, obtaining the necessary permits and performing the research will take some months, she said. For its part, the museum hosting the skull would be happy to sacrifice a bit of a tooth to highlight the importance of their exhibit, said Pier Paolo Visentin, secretary general of the Accademia di Storia dell'Arte Sanitaria, which runs the museum. Visentin noted that while we have names on Roman sarcophagi and burials in catacombs, there are no cases of major figures from ancient Rome whose remains have been positively identified – leaving aside traditions and legends linked to the relics of Christian saints and martyrs. For one thing, Romans have favored cremation throughout much of their history. And when they did bury their dead, they did not embalm them like the Egyptians, who have left us a multitude of neatly labeled mummies of pharaohs and officials. Finally, the Italian climate isn't dry like the Egyptian desert and the looting of ancient monuments that was common during the Middle Ages would have done the rest, he says. 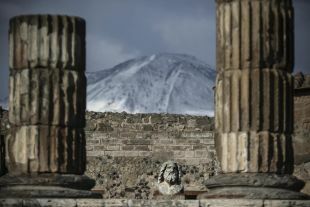 "This is quite a unique case, since these remains were preserved in the time capsule that is Pompeii," Visentin said. Besides his last, humanitarian gesture, Pliny is known for the books he wrote, ranging from military tactics, to history and rhetoric. His greatest and only surviving work was his Naturalis Historia (Of Natural History): 37 books filled with a summation of ancient knowledge on astronomy, mathematics, medicine, painting, sculpture and many other fields of the sciences and arts. Pliny's work inspired later encyclopedias: most of us at some point have unknowingly cited him. Perhaps, looking at these experiments on his possible remains, he would be skeptical of any conclusions, telling us to take them "with a grain of salt" and reminding us that "the only certainty is that nothing is certain." Or perhaps he would encourage scientists to forge on, repeating what, according to his nephew, he said when his helmsman suggested they return to port as scalding ash and fiery stones began raining on the fleet headed for Vesuvius. His response was: "Fortune favors the bold."